Summary:Universal Bitwar Data Recovery is a data recovery tool with disk scanning, disk diagnostics, data recovery and memory card file recovery functions. How Much Does Hard Drive Recovery Cost? Summary:Why is hard drive recovery cost so expensive from Data Recovery Company? read here to get more about hard drive recovery cost. Summary:The bitwar data recovery master can restore the U disk format file for the deletion of files, mistakenly format the disk, mistakenly empty the Recycle Bin. Summary:Have your desktop folders or files disappeared from Windows 10 ever? You might lose your users files or personal documents, pictures, videos, installed programs, games, etc. What is a storage device and how to use it? Summary:A storage device may also be known as a storage medium or storage media, digital storage, etc. which is used for storing, porting and extracting data files and objects. Summary: How to recover deleted files on android without computer? Such as messages, photos and videos, etc. Bitwar has developed an Android OS based APP that allows you to recover files on Android phone without computer. The mobile phone is the equivalent of our mobile computer, which holds a lot of important data, such as photos or videos taken at important moments. However, many Android phone users know that in the process of using a mobile phone, unexpected data loss disaster caused by different reasons occurs more and more frequently. We know data loss is a common problem nowadays, so we can deal with it calmly. If there is a computer around, you can install Bitwar Android Data Recovery on your computer to restore Loss data of mobile phone, but if there is no computer, how to recover deleted files on Android phone directly without computer? 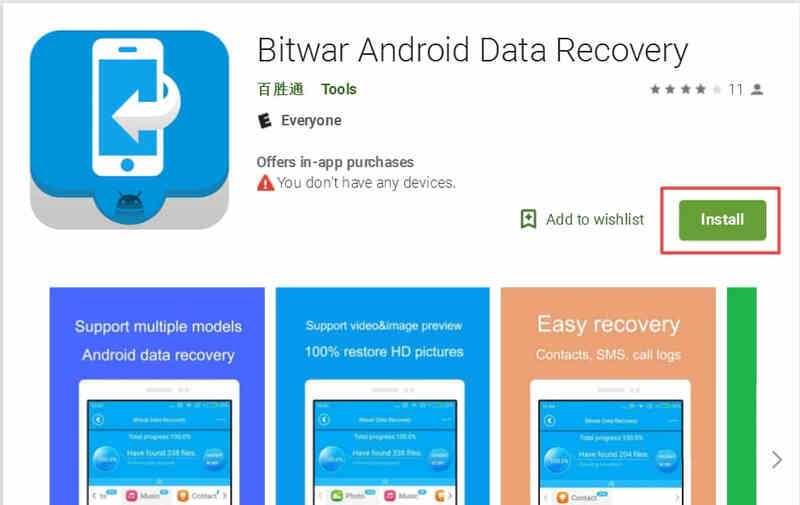 Luckily, Bitwar Software has launched Bitwar Android Data Recovery app version that supports restore lost data directly from Android phones. Simply download from Google Play by searching product name with Bitwar Android Data Recovery and then install on your Android Phone to retrieve your photos, videos, and messages. However, your device should be rooted to release authorization for running the application. Step One: Installing the app on your Android device. You can download it from Play Store right here: https://play.google.com/store/apps/details?id=com.xmbst.recovergoogle&hl=en_GB. Step Two: Launch Bitwar Android Data Recovery Application, if your phone do not contains root, it will inform you to root the phone first. We can click root to download the root application. Step Three: After root, there’s a “Analyze Device” window pops up before you go next with photo, video, audios recovery, etc. Step Four: Select the file types you want recover data from, you can select Videos, photos, audios, contacts, messages, call logs, and etc. the application will try to retrieve your previously deleted files on your phone. And you can see the files are appearing on the window. Summary：How to Recovery deleted videos from Android phone internal memory for free without computer? Bitwar Android Data Recovery Software can help you.